Welcome to Warhammer Tactics! Today, we’re going to look at some upper level movement tricks that you can use to help you control your opponent’s movement and deep strike options. The tactics we’ll be covering today will be useable with any units in the game, but they are particularly useful with Infantry units. Let’s dive in! First, we’ll be looking at how you can zone your opponent out from dropping into your army unwarranted. 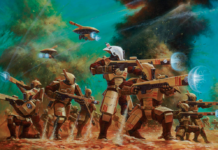 Many armies have units that, during deployment, can instead be kept off the table and brought in on a later turn. 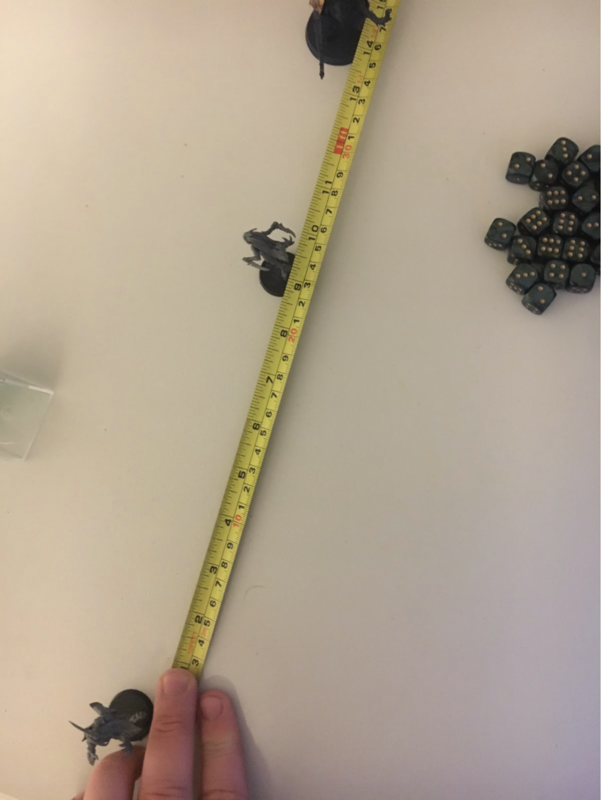 When your opponent sets these kinds of units up, they can be placed anywhere on the table as long as they are outside of 9” of any of your own units. However, with good placement of your own units, you can deny huge spaces of your own deployment, possibly ruining the use of these units entirely. 9” is enough distance to still charge into your lines, although it is a rather difficult distance to land. However, it’s possible to push these distances into much larger values with good placement of your units. Let’s take a look at this picture to illustrate. To help make the distances properly fit on camera, all distances are cut in half. In other words, 4.5” on camera represents 9” on a real game board. 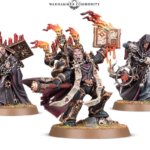 We have a photo of two Chaos Cultists, along with a Chaos Terminator. 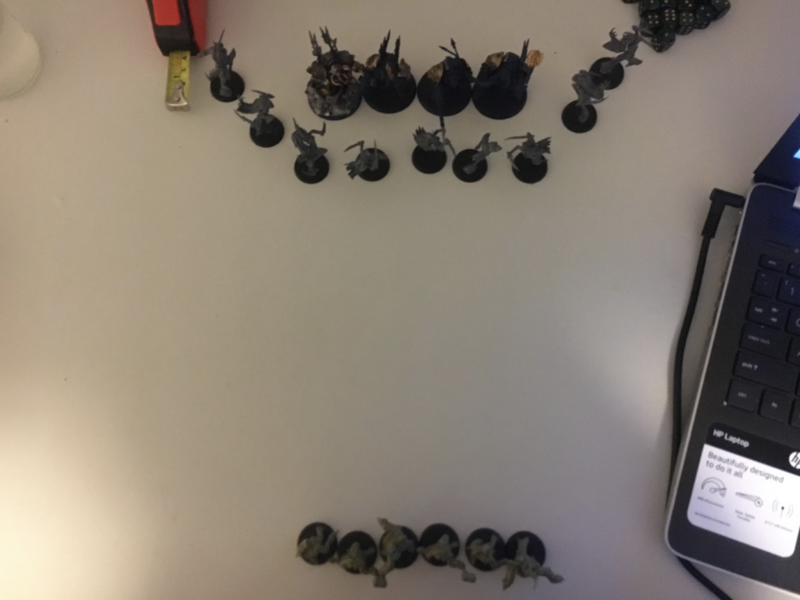 There’s 9 “ between the two Cultists (representing 18” on a real board), along with another 4.5” in front of the frontmost Chaos Cultist (representing 9”). Although this is a rather simplified example, as we’re only using a few models instead of entire units and cutting distances in half to make it cleanly fit, the idea is still 100% sound and applicable to any real game. The Chaos Terminator is unable to drop within 13.5” of the rearmost Chaos Cultist, which represents a whopping 27” on a real board. 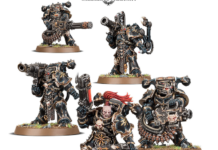 The reason we can push the Terminators so far out is because the Terminator can’t arrive within 9” of the front of the rearmost Cultist, 9” of the rear of the frontmost Cultists, and 9” of the front of the frontmost Cultists, giving us a total of 27”. It’s actually slightly more than this, due to base sizes as well. Obviously, this example is reduced to a single Axis, with no width. In a real game, you would also need to screen off at least some of the sides of the units you want to protect as well, but this is why Infantry are particularly good here. Since Infantry units tend to consist of many models that can be spread over a wide area, you can fan the unit out to help cover a lot of the lateral area. With proper placement, you can make it impossible for your opponent to deep strike anywhere even remotely near your important units. Next, let’s talk about a specific kind of screening, which we will refer to as “Speed Bumps”. Speed Bumps are units that are designed to get in the way of the enemy so they can’t properly move or charge the units that your enemy can’t reach the units he’s trying to get to. Let’s look at a bad example of a Speed Bump, followed by how we can improve upon it. In this example, we have a squad of Chaos Cultists attempting to screen a unit of Poxwalkers from getting charged. 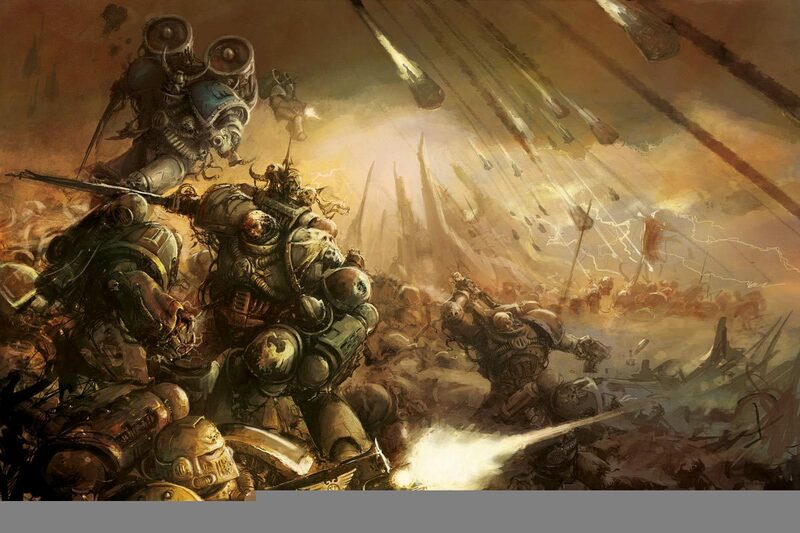 In real games, you’ll be protecting units far more important than some Poxwalkers, but they’ll do for today. 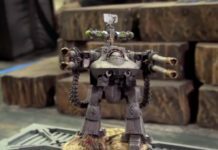 The Terminators were able to walk right up to the front of our Cultists, and they can then charge and wipe out the Cultists after some shooting and close combat attacks. Once they wipe our Cultists out, they then Consolidate into our Poxwalkers, and tie them up. This is not what we want to do with our Speed Bumps, but it’s a very common misuse of them. 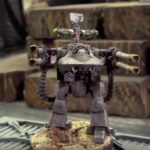 Let’s look at a different photo that demonstrates a more appropriate way of Speed Bumping that helps protect our Poxwalkers. Here, we’ve moved our important unit (the Poxwalkers) back just a few inches, and moved our Cultists far up the table, effectively surrounding the enemy Terminators. 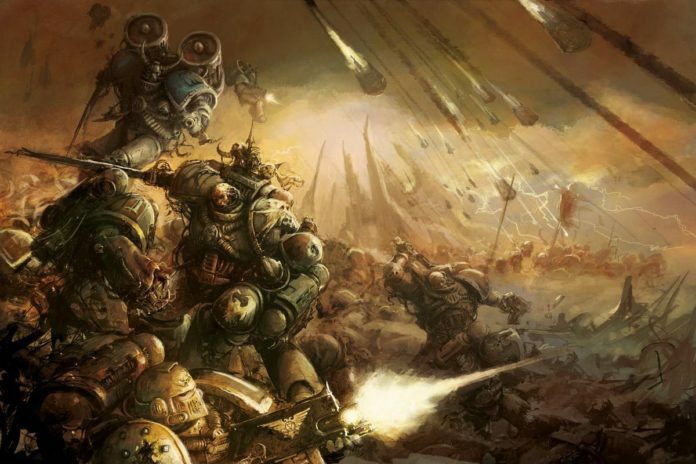 When the Terminators get their turn, they will have to retreat and walk around the side of the Cultists to try to close on the Poxwalkers, effectively nulling their movement. Alternatively, they can stand still and try and shoot away all of your Cultists. If he blows them all away, he has a very long charge to try to reach your Poxwalkers, and it may not even be possible for them to make it in. A very witty opponent will try to shoot away some of the Cultists, but not all of them. 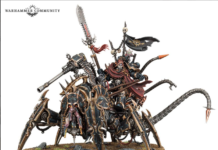 They can then charge both the Cultists and Poxwalkers, and try to take advantage of how Pile In and Consolidate movement works to try to reach the Poxwalkers anyways. The further the distance between your Speed Bump unit and the target you’re trying to protect, the less likely it is that they will be able to outplay this. In addition, some Infantry units can simply be too durable or have too many models to be taken out by a bit of small arms fire. When using large or durable units as Speed Bumps, you force your opponent to further decide whether he wants to overcommit to clearing out your Speed Bump to try to reach his intended target, or settle for charging and tying up the Speed Bump. 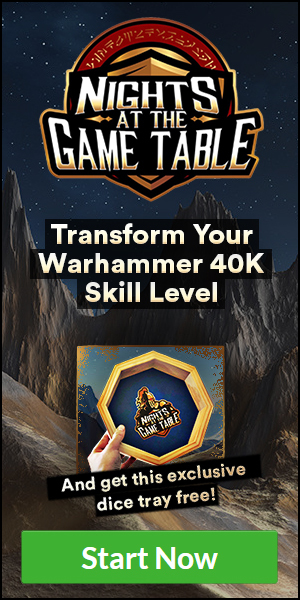 Either way, this is a win for you as you provide your key units more time to perform on the table uninhibited, while also controlling your opponent’s options against you. What’s great about this is that Movement always happens before your opponent has any way to actually interact and remove your Speed Bumps. Although they will almost certainly die, your opponent has to spend a turn dealing with them and then trying to reach you on the next turn. Sometimes, throwing a unit away to protect another unit is the right call, plain and simple. This actually wraps us up for today. Although this has been one of the shorter Warhammer Tactics articles, proper use of Speed Bumps and denying your opponent areas where he can deep strike are some of the most important skills to develop if you’re trying to push your gameplay to the next level. 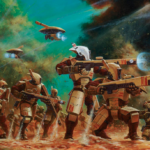 Make sure you don’t miss our next Warhammer Tactics article, where we are going to go over pacing in a game, and when you need to apply pressure or respond to your opponent’s pressure. 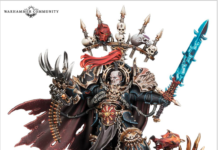 Previous articleThe Custodes Are Coming!